To read the full post and add comments, please visit the SogetiLabs blog: Context, Cards and Notification Design in Mobile. 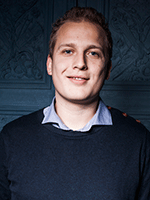 Thomas van Manen is an analyst at VINT. Thomas is working of VINT’s Design to Disrupt research project dealing with the accelerating speed of innovation and the design principles of disruption. Thomas is also working on designing mobile experiences for wearables and the internet of things. Past research focused on the impact of Big Data, Mobile Information Technologies, Gamification and the Web of Things. Thomas is also Chief Editor at the VINT research blog and was part of the HOT100 in 2012, a yearly selection of the most promising alumni in Media & Arts studies.